Kathy, the four kids and I relocated to Erie, Penn. in 1986, and I purchased our first sailboat, a Tanzer 22. It was our learning boat, and learning by watching others and reading all we could. The mistakes we made were classic. But we were hooked and ready to move up after three years, which meant a Catalina 27. 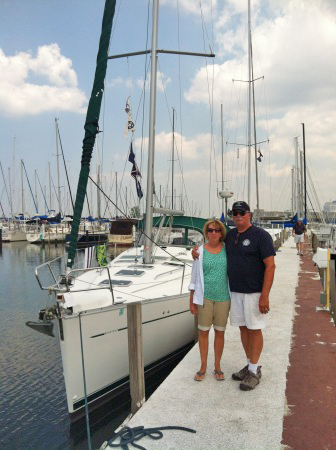 We purchased it in Sandusky and I singlehanded it back to Erie after installing an auto pilot. First time ever testing my navigation skills. No wind, so I motored all the way in sight of the coast. At six knots, you do see Cleveland all day. We sailed Dad’s Horse all over Lake Erie with four kids in tow for three years. Luckily, I was adopted by two excellent sailors, Ed Farland and Denny Herr who became lifelong friends, and we cruised with them on Lake Erie and Ontario. Did some racing on Wednesday nights. Needing more room as the kids were growing, we moved up to a Catalina 30 Affinity, which we sailed for 10 years. We joined Commodore Perry Yacht Club in Erie in 2008 and became part of a great club and now have a boating family. At that point the kids were well on their own, college and weddings. So, we moved up to a Beneteau 393 and plans for just heading off into retirement and south. Sailed that boat Affinity all over Lake Erie for 10 years. Work got in the way, and I was traveling so much we couldn’t put any extensive cruising plans in place. We did charter in the north channel, BVIs, did some of the Trent Severn on our Boston Whaler. We retired five years ago, continued to cruise Lake Erie and winter in Florida, where we spend a lot of time in the Gulf and Intracoastal Waterway. Somewhere in that timeframe six grandchildren arrived — which really changes your plans and priorities. And 26 years of sailing took its toll on my shoulders, so last year we sold Affinity in February. We had been looking for a trawler and were lucky to find a Mainship 34 Rumrunner in Punta Gorda that had seen little salt water or use. So, we purchased Harmony and shipped her to Erie, Pa. Last year was one of learning to be a power boater, and getting the boat used to us. This year, we’re planning the Erie Canal and Sackets Harbor. Next year, the Rendezvous at Little Current, Ontario and the Trent Severn.